Explanation: A mysterious, squid-like apparition, this nebula is very faint, but also very large in planet Earth's sky. In the mosaic image, composed with narrowband data from the 2.5 metre Isaac Newton Telescope, it spans some 2.5 full moons toward the constellation Cepheus. Recently discovered by French astro-imager Nicolas Outters, the remarkable nebula's bipolar shape and emission are consistent with it being a planetary nebula, the gaseous shroud of a dying sun-like star, but its actual distance and origin are unknown. A new investigation suggests Ou4 really lies within the emission region SH2-129 some 2,300 light-years away. Consistent with that scenario, the cosmic squid would represent a spectacular outflow of material driven by a triple system of hot, massive stars, catalogued as HR8119, seen near the centre of the nebula. 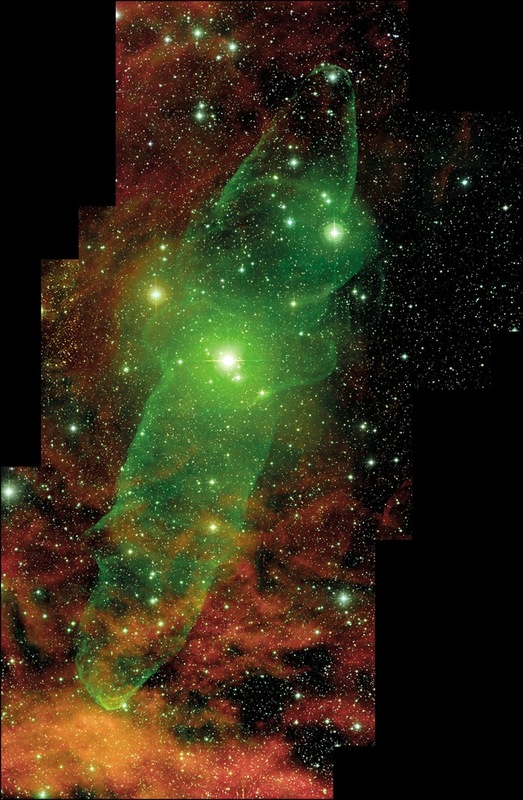 If so, this truly giant squid nebula would physically be nearly 50 light-years across.